If there’s any side dish Czechs love, it’s most definitely dumplings. Bread dumplings go perfectly with traditional Czech sauces like tomato sauce, dill sauce, svíčková (cream sauce) and of course goulash. Warm the milk to be tepid but not hot. Pour 100ml of milk into bowl, add crumbled yeast and sugar. Let leaven rest in warm place. Cut rolls into small cubes. Sift flour into clean bowl and mix with salt. Add eggs, warm milk and leaven (point 2). Knead thoroughly and at last blend in rolls. Cover bowl with cloth and let rise for 1 hour in warm place. After that devide dough into 3 or 4 parts. Knead again and form into long shaped rolls. Put in boiling water for about 20 minutes. Pierce with skewer to know they’re cooked. 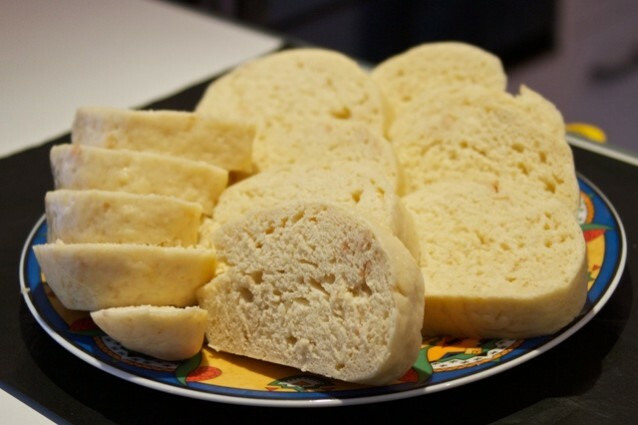 CzechCuisine.net helps you find the best recipes for meals that you can taste in Czech Republic. You can find out more traditional Czech recipes and culinary information. Discover the flavors of Czech cuisine. Copyright © 2019 Czech Cuisine. All Rights Reserved.